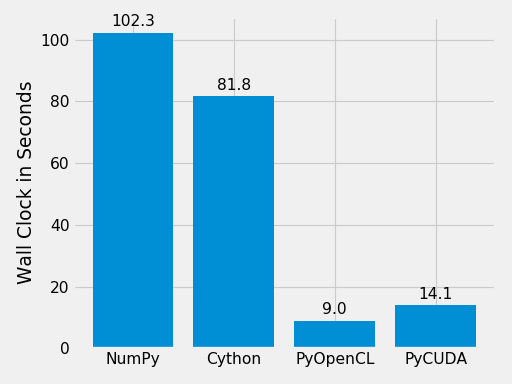 Bohrium is interoperable with other popular Python projects such as Cython and PyOpenCL. The idea is that if you encounter a problem that you cannot implement using array programming and Bohrium cannot accelerate, you can manually accelerate that problem using Cython or PyOpenCL. In this case, we use bohrium._bh.ndarray.copy2numpy() and bohrium.array() to copy the Bohrium to NumPy and back again. # This approach means that `x_buf` and `ret_buf` points to the same memory as `x` and `ret`. # Therefore, only change or deallocate `x` and `ret` when you are finished using `x_buf` and `ret_buf`. # Since `ret_buf` points to the memory of `ret`, we can simply return `ret`. The function _count() is a regular Cython function that performs the histogram calculation. The function bincount_cython() uses bohrium.interop_numpy.get_array() to retrieve data pointers from the Bohrium arrays without any data copying. Changing or deallocating the Bohrium array given to bohrium.interop_numpy.get_array() invalidates the returned NumPy array! # The OpenCL kernel is based on the book "OpenCL Programming Guide" by Aaftab Munshi at al. The implementation is regular PyOpenCL and the OpenCL kernel is based on the book “OpenCL Programming Guide” by Aaftab Munshi et al. However, notice that we use bohrium.interop_pyopencl.get_context() to get the PyOpenCL context rather than pyopencl.create_some_context(). In order to avoid copying data between host and device memory, we use bohrium.interop_pyopencl.get_buffer() to create a OpenCL buffer that points to the device memory of the Bohrium arrays. # CUDA kernel is based on the book "OpenCL Programming Guide" by Aaftab Munshi et al. Finally, let’s compare the performance of the difference approaches. We run on a Intel(R) Core(TM) i5-6600K CPU @ 3.50GHz with 4 CPU-cores and a GeForce GTX Titan X (maxwell). The timing is wall-clock time including everything, in particular the host/device communication overhead. Interoperability makes it possible to accelerate code that Bohrium doesn’t accelerate automatically. The Bohrium team constantly works on improving the performance and increase the number of NumPy operations automatically accelerated but in some cases we simply have to give the user full control.